So it's painfully obvious to me that even though this guy is finished, he needs some kind of "black" on the jetbike body to balance out the black on the canopy. I've got to come up with just the right pattern in just the right place to make the bike look "right." I only get one chance to paint this the right way. Chris over at Pit of the Oni did a quick mockup of this idea and now that CJ has also mentioned something similar in his comment, this might be the way to go. It's clean and adds enough black to balance out the bike overall I think. I need to be careful what kind of designs I add because I want to keep with the pattern I've already established. I know these might seem like self-imposed rules but it's really nothing more than looking at them now and getting a "visual feel." First off, I think it looks really nice! Maybe two parallel black lines on each of the fins aligned in the direction of travel would balance the coloration. Alternately, the bubble over the instrument panel could be red to balance that large black area and make red the predominant color. I photochopped the original image and emailed it to you. Just my two cents for whatever it's worth. Even with the black on the engines (whatever they are) I think the solid red wings still stick out as being too red. Basically I would suggest you mirror the colorsheme of the "standard" Jetbike. So all red would be black and vice versa. your work is brill, really loving the bikes. Army wise ive always hated the flying eldar, i could never quite crack them with my templars. I've tried a number of solutions before posting this one. Out of all the configurations I came up with, this looked the best to me. I'm afraid this isn't going to be as easy as I hoped it would be. At least I can start building my other ones while I try and figure out this last little bit. why not make the entire engine casing leaving the wings red but because of the full black border between your warlock body and and the red wing would make it look balanced I believe. I'm not a photoshop goeroe so have no ability to make it and see how it looks but I think it would look cool. If anyone can make it and post it here I would be very happy. Hmm, have you tried putting a couple more black stripes on the engines/wings parallel to what you have in the picture? I also agree with the above comment that making the 'bump' over the instrument panel red might help. If anything it seems too black to me right now. Nice one Ron I really like option A but that's me. what do all you other guys think? How about a thick and thin line of black on the ends of the wings at 90 degrees to wing tip? Bit like Naval rank arm markings. Black chevrons on the wings with white warlock runes on them.... instead of black on the engines, and a white rune on his helmet... just a thought. 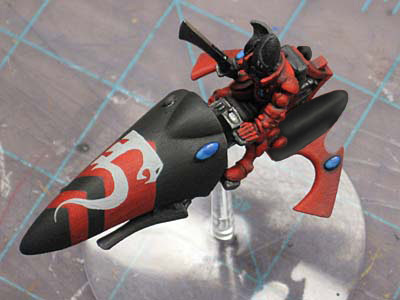 I like Eldar Jetbikes, I just wish they would update the rider model. They look like darth vader... That is not a good thing! I like the second picture, where the rear third of the engine pod is painted black. I also think a line or two on the wings would help as well. Dictator: Now that I have all mine built with the old heads... they should be releasing the new model shortly. But then I'll be "old school," or at least that's how I'm going to justify not buying the new ones. Ryan: I have to say, this is a hard one for me, I'm hoping I have some great idea between now and the time I finish painting the last Warlock so I can get them all straight. Who knew you could struggle so much with just two colors.